Avanilaya is so private that from the outside, there are no signs that it exists. There are no advertisements anywhere, and no signboards. On the road, there's simply a nondescript gate. Apart from the fact that its manned by a security guard, it gives nothing away, no hint of what lies beyond it. However, inside the gate is a 24 acre paradise. It's there that the true Goa can be found, away from the commercialized coastline. A paradise within a paradise, there are very few places like it left in Goa, or indeed the world. Meaning "earth abode", Avanilaya is a place where nature is nurtured and protected from human destruction. Shrouded by the thick foliage are three newly renovated villas, also deceptively understated from the outside. Upon entering, they speak to you in a serene and elegant way. Each room tells a different story with its unique design and exquisite individual furnishings. Traditional is blended with contemporary. Billowing curtains, four-poster beds, sunken bathtubs, bathrooms that are almost like living spaces, lanterns, chandeliers, floor cushions, and a transfixing collection of antiques and objets d'art. As you walk around Avanilaya, you'll find items of interest everywhere you look. The sprawling living rooms feature eclectic coffee table books showcasing various countries across the world. Not surprisingly, Avanilaya is a sanctuary that attracts many artists, writers, and musicians. The tranquil energy soothes the mind and lets the soul speak. Inspiration and creativity readily flow through. As I sat, writing, I looked out to see a peacock strolling past me. Apparently, there are around 80 of them on the property, and their calls can be heard frequently throughout the day. The many other types of birds that inhabit the surrounding area also make Avanilaya a paradise for birdwatchers. The three villas at Avanilaya were originally built by Loulou Van Damme, a free-spirited, sixty-something eminent hotelier and interior designer of Belgian descent. The property was sold to its current Goan owner in 2011. Each villa offers something different for guests. The main and largest villa, Panchvatti, means five trees in Sanskrit. It has five bedrooms and two living rooms. The rooms are set around a grassy front courtyard. There's a porch that runs along the rear of the building, accessible from the living rooms and one of the bedrooms, that also serves as a dining area. The porch overlooks the large infinity swimming pool at the back of the property, nestled amongst the trees. This swimming pool is shared with the guests of The Third Place villa nearby. In contrast to the Indo-Portuguese style Panchvatti villa, The Third Place is designed to be ultra modern. Its name is derived from the term coined by renowned American urban sociologist Ray Oldenburg, which refers to a place to relax away from work and home. 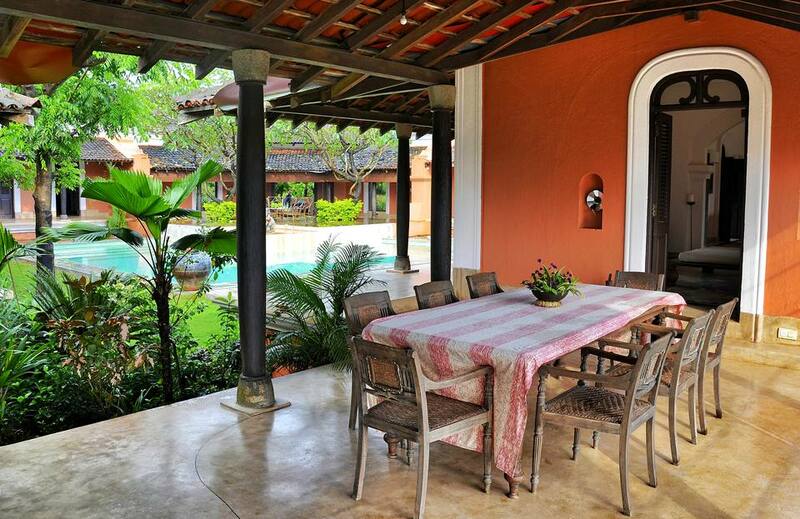 The villa has four bedrooms, spread over two levels, and a mesmerizing terrace that overlooks the river. 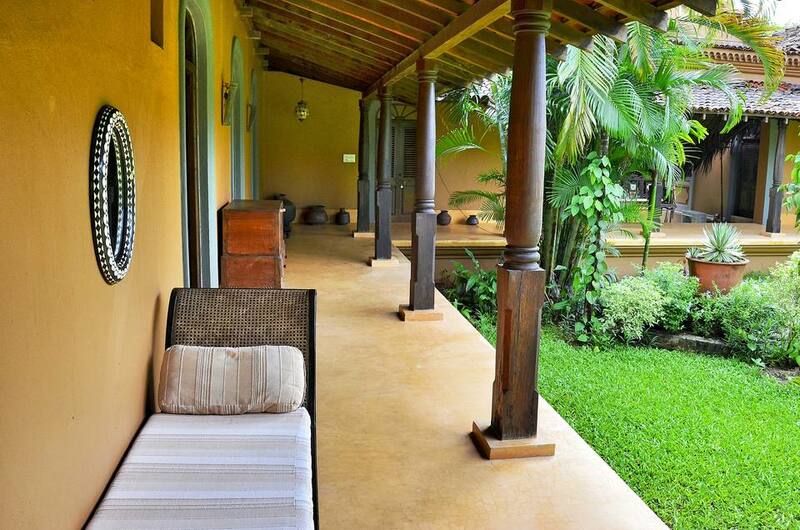 Padimunu villa, meaning 13 in Tamil, is the smallest and most intimate of the three villas. It has three bedrooms, an elongated living room that occupies one side of the building, and a courtyard swimming pool. Inside, bursts of color contrast with crisp and chic whites. The stand out feature of this villa is its substantial outdoor undercover dining and sitting space, adjoining the living room, that can be fully opened to nature from the sides. Avanilaya is known for its cuisine, which is a fusion of Continental and Goan specialties. Each villa has its own kitchen and chef. There's no set menu. Rather, something new and different is always being prepared, much of it what you won't find elsewhere. Avanilaya even bakes its own pastas and breads. My four course dinner consisted of a chilled creamy carrot and apple soup, which was definitely a dish I had not come across before. It was followed up with char-grilled vegetables in a balsamic vinegar dressing, prawn curry with mango sauce and local rice, and chocolate souffle for desert. Lunch was an extravagant traditional Goan spread -- marinated roast beef and chips, mackerel fried in fiery recheado masala (ground red chilies, garlic, cumin, peppercorns and tamarind in a vinegar-based paste), prawn curry with okra, ridge gourd, tisreo (clams), and two types of pickle made out of amade (hog plumbs) and bilimbi grown on the property. It was topped off nicely with a delicious refreshing lemon mint herbal tea. Even though Avanilaya doesn't have a restaurant, it's possible to make a reservation and have a meal there if you're not a guest. Up to 60 people are catered for. To be as eco-friendly as possible, there is minimal use of plastic at Avanilaya. Aquaguard filtered water is provided in glass bottles in the guest rooms, rather than drinking water packaged in plastic bottles. Composting and rain water harvesting is carried out, and tank water is used for the garden. Avanilaya also has a vegetable garden that produces many of the ingredients used in meals. Avanilaya is a refined haven for anyone wanting a luxurious stay but with the privacy and personalized service that's not possible at a resort. This rare hidden gem provides the perfect opportunity to experience how Goa used to be before it became developed, but without sacrificing any comforts including air conditioning (all rooms are air conditioned, although do note that they don't have TVs). The villas are particularly suited to groups of guests traveling together. Avanilaya is also a sought after secluded wedding destination, and the property is decorated in an ethereal way for the occasion. Avanilaya is located in the Goa hinterland in near Aldona village, 30 minutes from capital Panjim and around an hour from the airport. Airport transfers can be provided. Rates start from 12,000 rupees per night for a double room, including breakfast and taxes. A minimum two night stay is required. The whole villas can be booked for 34,500 rupees per night upwards. Weekly rates are also available.